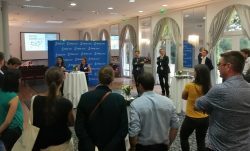 On last Wednesday, September 12, on the occasion of the international exhibition for animal production (SPACE 2018), our HR teams from TIMAC AGRO France and TIMAC AGRO International organized together an AfterWork at the Château d’Apigné. The purpose of this event, held in a human size format, was to make us known in an original and friendly way. First of all, Nicolas Vermersh (Centre Mondial de l’Innovation Roullier Director), Cyril de Bernis (Centre-Normandie Agro-Supply Director) and Jean-Baptiste Moussière (Regional Director within TIMAC AGRO France) presented their professional background and experiences in our company. The evening continued with a special edition of the “Burger Quiz show” dedicated to agriculture. Finally, the participants were able to meet other internal ambassadors during a cocktail.